Hargraves Beach House has 2 bathrooms next to the front and back bedroom areas and an additional bathroom in the double garage at street level. There is a toilet in each of the bathrooms and a guest toilet near the main living area. We use 2 seperate solar powered high capacity hot water systems and assure you that you will not run out of hot water. Linen – includes sheets, pillowslip and bath towel. Bathrobes can be hired separately. 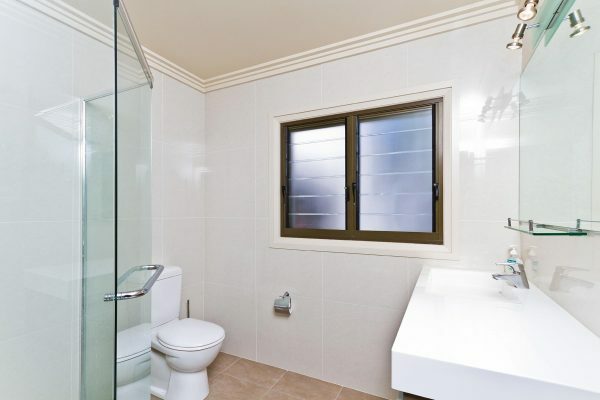 Front Bathroom – Hansa tap mixers and 3 spray function hand held shower head, laminated glass shower, double basin vanity with double-lit mirror, porcelain toilet, electric towel rail heater and exhaust fan. 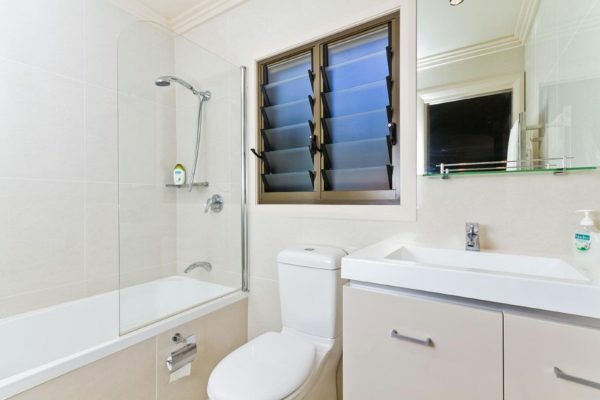 Back Bathroom – Hansa tap mixers and 3 spray function hand held shower head, 1.2m shower/bath, single basin vanity with double-lit mirror, porcelain toilet, electric towel rail heater and exhaust fan. Double Garage Bathroom – top quality tap mixers and 2 spray function hand held shower head, laminated clear glass shower, single mini basin, mirror, porcelain toilet, and exhaust fan. We have 2 solar powered water heating units to ensure unlimited hot water. Liquid hand Soap and 3 ply toilet paper is provided to all bathrooms and toilets. 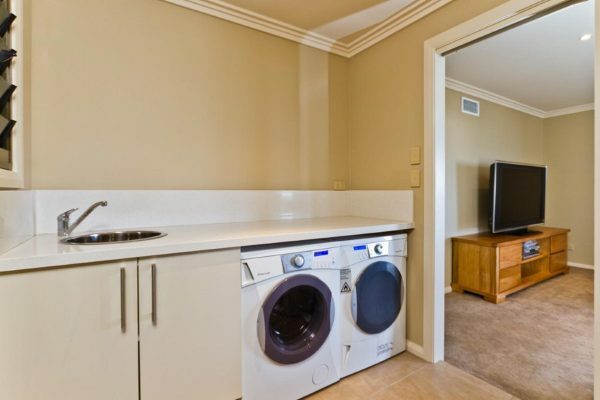 Located off the main lounge area, this is a modern and utilitarian laundry with large capacity top of the range appliances to cater for the requirements of up to 12 guests. Bench – Caesarstone Quartz, 3 metres long, under bench basin and turnable sink mixer. Kleenmaid Washing Machine – 6.5kg capacity, front loading, quick wash option. KleenmaidCondensor Dryer – 6.5kg capacity, no moisture in the room. Two waste bins are supplied for single use. Both Sulo waste bins are 240 lites. That’s double the size allowed for a normal weekly Central Coast garbage pick up.